Cody Cornell is the Founder and CEO of Swimlane. Cody is responsible for the strategic direction of Swimlane and the development of it’s security operations management platform. Collaborating with industry leading technology vendors, he works to identify opportunities to streamline and automate security activities saving customer operations costs and reducing risk. 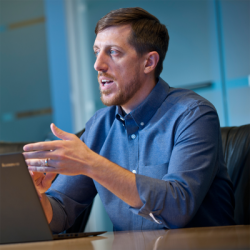 In 2011, Cody co-founded Phoenix Data Security Inc., a focused cyber security professional services organization. Prior to Phoenix Data Security, he began his career in the U.S. Coast Guard, spent 15 years in IT and security including roles with the U.S. Defense Information Systems Agency (DISA), the Department of Homeland Security (DHS), American Express, and IBM Global Business Services. Cody has presented at information security forums such as the Secret Service Electronic Crimes Task Force, the DHS Security Subcommittee on Privacy and National Public Radio (NPR), as well as to many industry associations such as (ISC)2, ISACA and ISSA. In this episode we discuss his start in information security, mentors he has had along the way, why he is building a business in Colorado, founding a information security company and the problems he is trying to solve, cyber security automation, so much more.